A world-class commercial centre and a key travel hub, King Abdulaziz International Airport (KAIA) is the busiest airport in Saudi Arabia, with its expansion being the most important strategic project in Jeddah. Phase-II mainly comprises of laboratory testing services during the construction stage. RGF established material testing laboratories for soil and asphalt on-site. 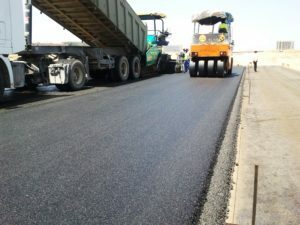 “All backfilling and asphalt paving works are being monitored and supervised in collaboration with the consultant to ensure quality construction works,” Eng. Hamid Ismail, Manager Western Region continues. 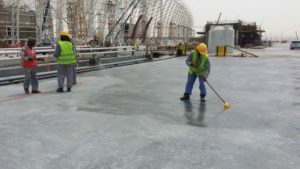 “Site sampling is performed in the shape of in-situ density tests augmented with laboratory analysis of soil and asphalt samples to ensure that project specifications are being addressed.” All construction materials are tested to the highest industrial standards in RGF ISO 17025 accredited laboratories in Jeddah. Hydro-geological studies have also been performed for the prevailing groundwater aquifers at KAIA, both during Phase-I and Phase-II of the project. “Several deep wells were dug and pumping tests were performed to determine the hydro-geological parameters of the ground aquifers, including storage coefficient, specific yield, and permeability coefficient. The geochemical environment was also explored at KAIA, with RGF performing a great number of chemical and environmental tests of the soil and groundwater,” Eng. Hamid Ismail, Manager Western Region concludes. The Princess Nourah University (PNU) is noted for being the world’s largest women’s institution of higher education, covering a footprint of over 800 hectares. A mega-project with stringent specifications and quality demands, it called upon a number of the industry’s most respected and sought after organisations, including the specialist engineering and contracting company, Riyadh Geotechnique & Foundations (RGF). PNU’s area and location is unique due to the large variations in soil stratification and condition, which required a versatile geotechnical report to be produced within a tight schedule. Moreover, during the project the uncovering of localised water-sensitive soil required further investigation and testing. “The groundwater within that area is relatively deep – some 80 metres below ground level – and this made the water-sensitive soil a real threat when surface water made contact, resulting in large deformations within the soil and minor cracks jeopardising the integrity of the structure,” says Ayas. RGF swiftly executed a campaign to identify the danger of the strata, which was subsequently excavated and replaced with select fill depending on its thickness, or submerged with water to reduce its sensitivity. With extensive experience of providing cost-effective, sustainable and environmentally-friendly solutions to the most complex and demanding technical challenges, Riyadh Geotechnique & Foundations brings together expertise across a broad array of specialist disciplines, including, but not limited to, geotechnical site investigations, topographical surveys, hydro-geotechnical studies, structural engineering, and shoring work. The company’s ability to take technical problems and turn them into real practical and commercial solutions has seen it successfully complete a wide range of important and prestigious projects. One excellent case-in-point is the King Abdulaziz Conference Centre in Riyadh, working in conjunction with long-term client Saudi Oger, for the Ministry of Finance. King Abdulaziz Conference Centre is the main component of a major development that also takes in a Ritz-Carlton Hotel. Through targeted site investigation and risk assessments, the company delivered an integrated strategy for the scheme which, whilst simple in a structural sense, was also very complicated. The two main halls, for instance, cover huge areas with not a single column to be seen. Instead, heavy 4.75 metre-high prefabricated concrete beams were lifted into place so that work could begin on the suspended ceiling before the slab. Riyadh Geotechnique & Foundations provided a comprehensive range of services on this development, taking in everything from soil investigation and foundations excavation work through to materials testing and cavity probing.